Are you tired of going to the gym day in day out? If so, bring your gym closer to you with hand weights. They are often referred to as free weights since they are not attached to any machine. What’s the point of using the weights? The goal is to add effectiveness to your workouts. Here are some of the best hand weights worth your time and investments. If you are looking for stylish hand weights to add to your workout regimen, these are the best. You can use them while doing your goblet squats, bicep and triceps curls or chest presses. Crown hand weights are coated with neoprene to provide sufficient grip. Therefore, you don’t need to worry about losing your grip when your hands sweat. With this weights, you don’t need to wear hand weights gloves. The neoprene element is there specifically to protect your hands. These hand weights are awesome for aerobics. SPRI dumbbells are available from 1-10 pound and in 12, 15, 18 and 20 pounds. They are coated with vinyl to make it last longer. Therefore, you can even use these weights 100 times a day. Aside from burning calories, they add resistance and intensity. You can also incorporate SPRI during your physical therapy session. Spice up your indoors and outdoors exercise with this awesome tool. You can check it out at hand weights Walmart sellers. C9 Champion is super comfy, durable and high-quality. Just like Crown, it is made of neoprene to add grip and prevent slippage. The hex shape, on the other hand, prevents the weights from rolling around. You can get C9 Champion hand weight from 2-15lbs. If you think this weight will serve you well, go for it. Check target online sellers to purchase these types of hand weights. Hand weights can bring more harm than benefits to your workout if not carefully selected. Take your time and purchase only what suits your arms. Are you torn between using fixed hand weights and using adjustable hand weights? Well, here is the thing, consider the following steps first. Hand weights come in different shapes and sizes. To some adjustable hand weights are the best while to some fixed dumbbells are perfect. You only need to choose something that goes hand in hand with your workout and arms. It’s better to choose something that will help build your arms strength, tone your hands and keep your muscles intact and in great shape. Hand weights are designed using different materials. These weights can be made of neoprene, plastic or metal. Some can be smooth while some can have contours. The contours are specifically for placing the fingers. You simply need to choose the style that best suits you. Why not go for hand weight set if you are capable to buy one. You only need to purchase one set to get a variety of hand weights. A recommended standard combination of weights to purchase is from 5-15 pounds (two each). To check whether you picked the right weights, pick the lightest of them and try to do 10 reps with it. If you find it non-exhaustive, the package is ok.
Reps are the number of repetitions you can do in a routine. For beginners, it’s good to start from 10-12 reps, and then work your way up. However, it all depends on your ability. To those using hand weights for walking, be extremely cautious. These weights can spike your blood pressure when used for walking. To prevent such risks, walk with 1pound or a maximum of 3 pounds hand weight. Regardless of the type of weight you use, ensure it’s not more than 10% of your body weight. You can also go for other alternative tools like wrist weights, weighted vest or walking poles. To protect your hands as you use the weights, wear hand weight gloves. Gloves relief your hands from the dumbbell weight, provide better grip, support and prevent blisters. Get quality gloves from Walmart best sellers. Knowing how to do the hand weights exercises is essential. 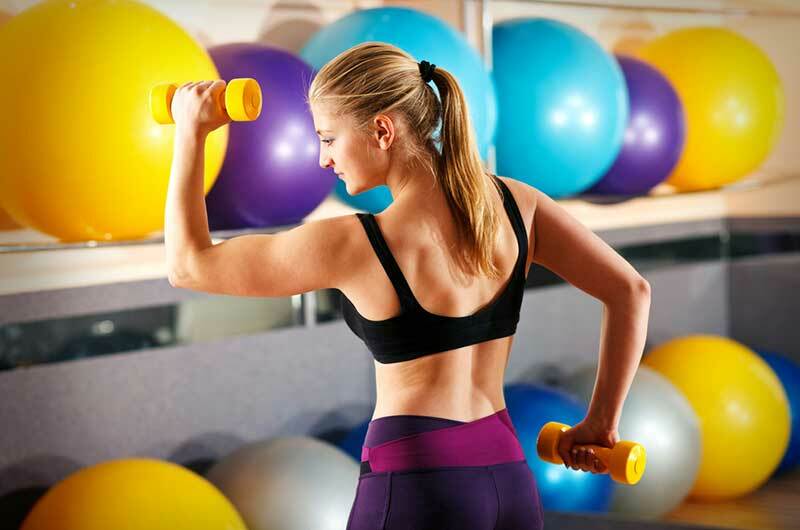 Hand injuries and muscle strains can be prevented when workouts are done correctly. Do you want to see the results quickly? Be smart and consider the following awesome ideas. Always wrap your thumb below the handle with your fingers over it when holding the weights. Your arms should also be straight during the exercise. Don’t arch your lower back when performing your overhead presses instead, maintain a straight back. This will help you avoid unnecessary back pains. Doing quick reps won’t make you lose weight faster. The only results you will get is muscle pains. Doing the reps correctly (not too slow) will make your muscles contract and expand. In short, don’t rush your repetitions. To the triceps kickback workouts enthusiasts, here is what you need to know. When doing triceps kickbacks, avoid dropping your elbows while lifting the weights. To isolate the triceps, keep your legs parallel to the floor. Don’t drop your head when doing your weighted squats. Without crunching your neck, keep your forehead up. Biceps curls exercise is more effective when your arm goes all the way down. Therefore, avoid lifting the weights half way. Do your hand weight exercise first before cardio. Cardio will exhaust your energy hence you won’t be able to do the weightlifting effectively. Have you ever tried using hand weights during your normal workouts? If so, do you find them worth the investments? And have you seen any positive results after using hand weights?